I have 3-1250 Hp. Reliance drive motors on an overland conveyor. One of the motors seems to be oscillating when running, this is creating noise in the gear train due to the oscillations. I have strobed the H/S coupling at 1800 RPM and it appears the motor is trying to stop. When you look at the attached video you can hear the gearmesh noise when the coupling drops down. I have strobed the other 2 motors and you can see the same thing with the coupling and slightly hear some gearmesh noise, not as bad as the one in the video, but off course the motor in question is affecting the the other drive motors. These motors are running on a Toshiba VFD and they generally run at 1800 RPM when running at max speed. What could be causing this? Always difficult to analyse without any spectra and detailed info but I suspect this noise frequency is somehow related with the gearbox output rotation. Check it. If so, you could have some output shaft issues (eccentricity, damaged bearing, something is breaking the conveyor, belt is oscilating etc...). This unconstant load could lead to some VFD issues or mechanical issues. For detailed source you should measure and attach as much vibration data as possible. Old machine or new machine? Has the issue always been there or is this something relatively new? I have generally found that if this is a new problem and at some former time the machine was OK, then a careful investigation of the VFD is justified. I have been doing vibration on this belt line for a year now. I have always heard a noise from the gearbox, but until now I never knew where it was coming from. This belt line has been in service since 2007. Any way you can shut down and get a look inside the GB through an inspection opening? The opens aren’t alway obvious; in a fabricated steel housing they tend to be a bolted on plate. In cast housings I have seen bolted on plates and sometimes a good sized pipe plug. Appears to be a torsional vibration issue. Does the cycling stop at different operating speed? What type of shaft couplings are used? Not sure what it does at different speeds, usually runs full speed. Falk grid coupling. I don't have the time at the moment to analyze your audio track. Have you confirmed the source of the high pitch frequency (gears or electrical)? Have you measured the modulating frequency, and confirmed it is same as visual frequency? 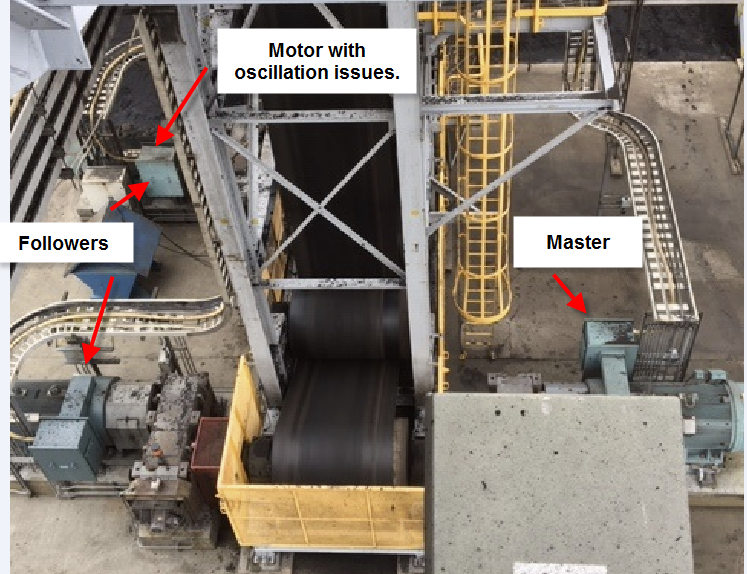 Have you looked for this frequency in the conveyor drive and slack/tension take-up rollers? Throwing another wrinkle in the picture, this also could be a rotor bar issue with the motor? Yes, that is something I have thought about. So far, I have not come across any vibration data that would indicate a rotor bar issue. It's very possible! I have seen a VFD have a torsional problem where the gear teeth could be heard unloading and loading - as Walt says, this cannot be ruled out. If you know the torsional natural frequencies you can check the vibration data to see if these frequencies (one of these frequencies) is excited. I am inclined to think it might be electrical, possibly like Dave mentioned, rotor bar. Can you take a low fmax 200 Hz high resolution spectrum, at least 3200 lines, and see what the sidebands, if any, are riding on 1x, 2x, 3x, etc. and then calculate the Line Frequency feeding it at the time of the data collection? Just a thought. One of the motors seems to be oscillating when running, this is creating noise in the gear train due to the oscillations. Maybe the gear has the issue and is causing the motor oscillation, instead of the other way around as you've described it. Tooth repeat frequency comes to mind. It is a low frequency phenomenon that is the result of errors that exists in both the gear and pinion. When the two areas simultaneously "pass" through mesh, noise and vibration are at a maximum. Then, relatively speaking, a considerable amount of time may pass before these areas again come into mesh. The time interval can be so slow that the rate can be determined simply by counting while observing a second hand on a watch. Do you have the tooth combination or some very exact speeds (obtained simultaneously) of gear and pinion to allow an estimation of a tooth count? I've worked with Toshiba VFDs for over 30 years and have seen oscillations similar to the one in your video many times. Before doing a lot of mechanical troubleshooting check the speed reference into the VFD to see if it's fluctuating slightly. An easy test is to take manual control of the VFD and set it for 60 Hz and then check with your strobe light. Please let us know what u find. Similar to jvoitl, I have seen VFDs cause torsional oscillations to the point of hearing the gear teeth unload and load. I've seen this being sensitive to load and speed, too - exciting (self-exciting) a torsional natural frequency. One can see (generally) when torsional frequencies are excited from the vibration at the gears. Thanks for the response with a troubleshooting idea. I checked the RPMs' on each motor the other day and this is what I come up with. I looked at the data again and can't find issues with the rotor bars. I will take a 200 HZ reading and see if there is anything there.. Check the VFD settings. Speed control may be set to 'hot'. In other words, the controller is trying to maintain too tight of a speed control. This can cause modulation in the motor. Usually the speed control settings from the factory, if not changed, are not realistic for some field applications. I will pass this on to the electrical group. I's still like to know the tooth combination or exact speeds (to back calculate tooth counts) to run the numbers on the anticipated tooth repeat frequency. Bill, Yes! I saw three DC motors on a paper machine shear off the locking tabs on the keys due to the drives being tuned too tight. Our guys sent a 3 roll vinyl mill out three time for repair and the third time they sent the motor to the shop. They called me on the third start up to check it. Me first guestion was the tack drive checked. As it turned out the only repair it needed was the tack drive coupling replaced. I’ve seen that too, but in this case the end user has three motors all behaving similarly. The guys were getting a fault on one of the 3 tach drives yesterday. He changed it out and one of the electricians said it made no difference on the test run, but the plant has been down all day today so I could take look at it myself. Thanks for the links William, I will check them out. 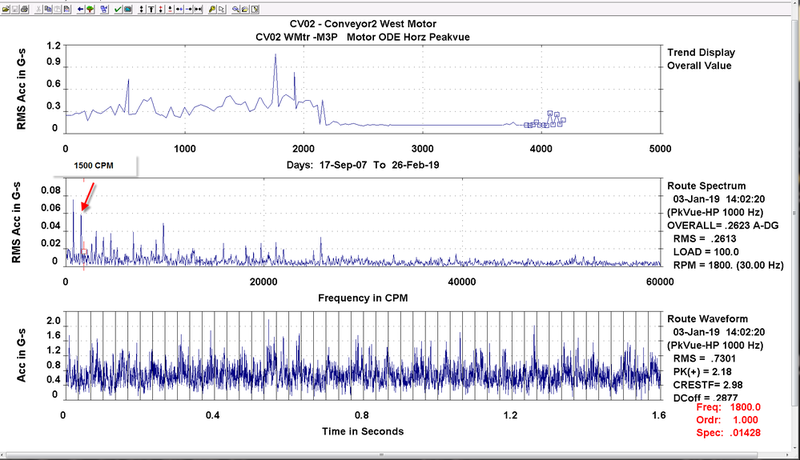 Can the motors be decreased in speed, say 300 rpm, to see if the problem goes away or maybe better yet, can you check it on a slow startup to see if the problem is there at lower rpms and where (what rpm) does it appear? BTW. 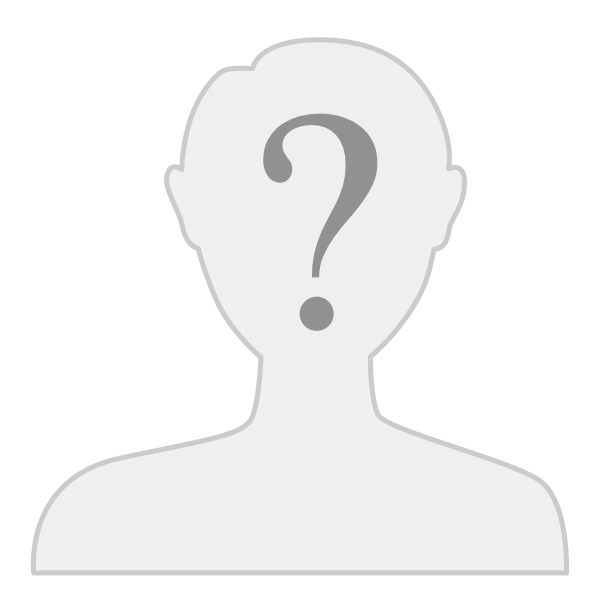 Do you use CSI analyzer and Software? Yes, I do use a CSI analyzer and software. I will try to slow the motors down a bit and see if it goes away. 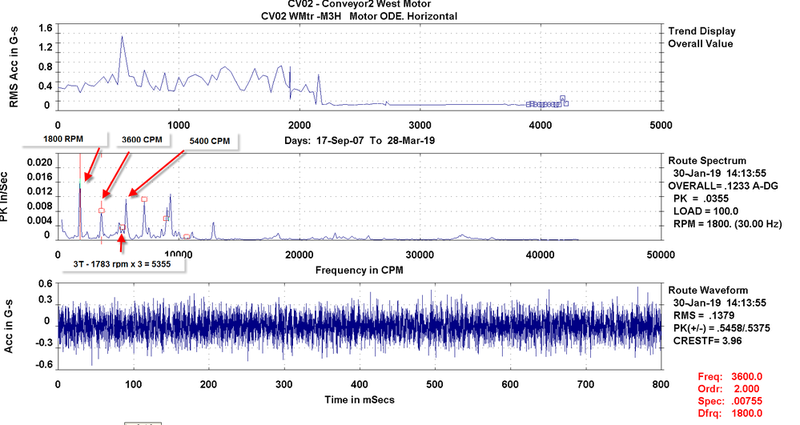 A rough stopwatch measurement of the audible sound modulation (amplitude modulation) yielded a frequency of about 1.6 Hz or 95 cpm. The visual change of shaft rotation by strobe-light may or may not be at the same frequency as the audible sound amplitude modulation. A longer video saved in video file format would be helpful for analysis. If the strobe-light was simply set as a fixed frequency, and not triggered from vibration, then the shaft speed has to be speeding up and slowing down at a cyclic rate (frequency modulation). The question would then be what can cause frequency modulation of shaft speed and amplitude modulation of sound (and probably vibration)? The two possibilities are electrical (control feedback hunting, or some issue with the VFD) or mechanical load variation in conveyor system. Load variation can affect slip speed of an induction motor (even with VFD), so this might be possible, except speed variation would be small. The other question is why the motor in question was running 13 rpm lower than the other two? Apparently it is not connected to the same conveyor belt! Thanks for the reply Sledder. 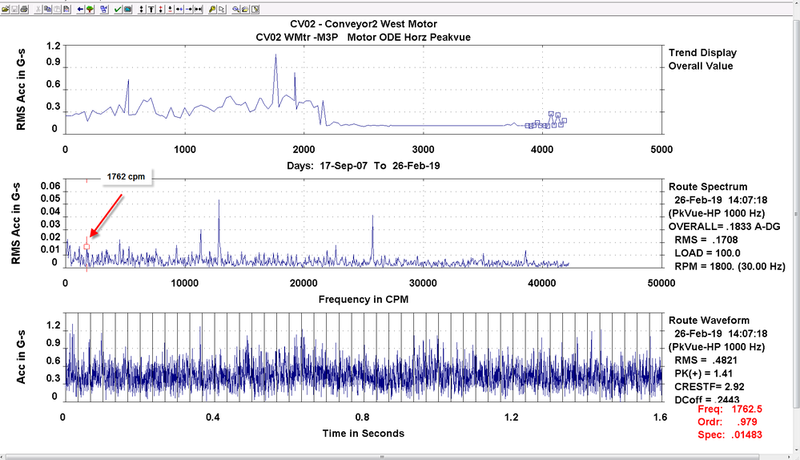 Can you take a Peakvue data set (acquired off route)with a, 1K HP Filter, 1K Fmax, 6400 lines and a 2K HP Filter with a 1K Fmax 6400 lines spectrum and waveform on this motor at the bearing point where the highest 1x amplitude is showing and post them here? Or you may already be taking route Peakvue data, if so, are they at or close to these setting I suggested? Edit: You would not happen to know the rpm when you took your video, would you? One cannot hear 1.6 Hz. The frequency of the oscillation must be different. As you said this may be the modulation of the intensity of the sound. I'm not exactly sure what the RPM was the day of the video. 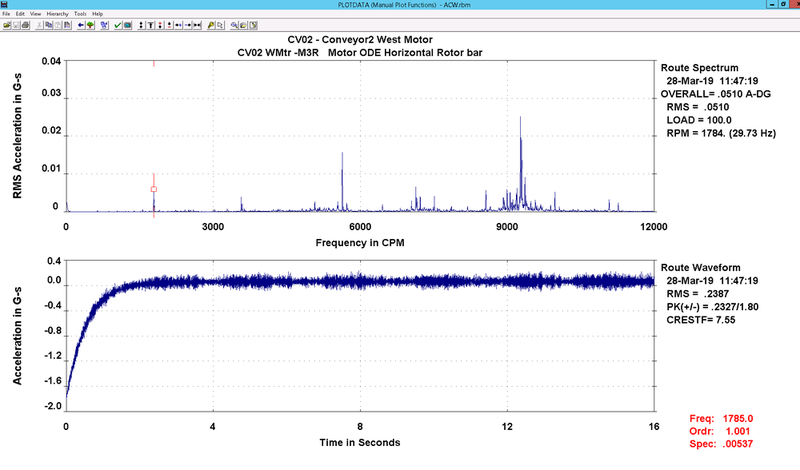 The most recent RPM taken was 1783 RPM with the same type of oscillation. The other 2 motors were running 1796 RPM. I am currently running the following for my P vue setting. I will give your settings a try. The plants have not been running much lately due to the flooding in Nebraska, the trains aren't coming like they should be. The Electricians have been checking over the drives, and so far have not found anything obvious. They did change out a tach drive last week, but I have not been around to check anything to see if it helped. One of the guys said it made no difference. Plants aren't running much lately due to flooding in the midwest. Yes, all 3 motors are connected to the same belt. Here's the layout. Motor 1 - is the master / motor 2 and 3 are the followers. Motors 1 & 2 drive the same drive pulley shaft. Motor 3 is driving a drive pulley by itself. Motor 3 is the one having the oscillation problem. I will take picture of the layout to help explain. I was talking to our plant programmer the other day and, I told him what I am seeing. We looked at the drives in live time and everything looked good. If I remember correctly, he told me that the drives are torque sensitive. Could it be the drives are telling motor 3 to back off a bit. (you know what I mean). Remember, motors 1 & 2 are tied together, motor 3 is driving its own drive pulley. Again, the tooth combination would be desirable to rule out tooth repeat frequency which typically causes a low frequency audible beat. The key is that the same speed reference is feeding all three motors, so it does appear to be an issue with over/under compensation. 1K Hz HP filter / 100 Hz Fmax / 1600 lines / 1 average Can you post the latest of this data with a vertical scale which shows 1x near 75% of the full vertical scale? Here is some data taken in February. Here's the spectrum taken on the rotor bars. 1X is coming in at 1785, I put the strobe light on it last week and that's where it was running. It looks like the timewave form is showing the oscillations I am seeing with the strobe light. Can you post the spectrum in velocity with out an autoscale vertical, but make the 1x be 75% of full scale? Can you zoom in on the 3x rpm in Velocity also? Did you take any Peakvue 6400 Lines, with the HP Filter of 1K Hz and Fmax of 1K Hz and also a 200 Hz Fmax and 2K HP Filter with a 2K Fmax? I will take more readings today. I zoomed in on the 3X times in the data taken 1/28/19, there is nothing there to zoom in on in the last two recordings taken, not sure why that happened. Here is the layout of the 3 - 1250 Hp. motors. I am wondering what the resolution is on the spectrum you posted. Is it fine enough to see something if it happened to be at 1Hz (60 rpm) sidebands off a carrier frequency? Have you monitored the " oscillating" when the power is "cut" to see if it disappears instantly? Or have you changed speeds or monitored a slow start up to see when it might start oscillating? Have you monitored the " oscillating" when the power is "cut" to see if it disappears instantly? Or have you changed speeds or monitored a slow start up to see when it might start oscillating? No, I have not done this. Still wanting to change speed to see if it goes away.